Summary: Whether you’re looking for your soul mate – or just a great date – TRUE will help you find what you’re looking for. True is the only online dating service endorsed by Psychology Today and no other internet dating service conducts criminal background screening and single certification. True has millions of members that are online daily. 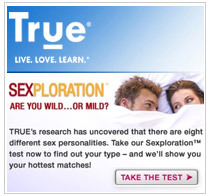 True's own compatibility testing system helps you narrow down and find singles in your area that share similar interest. What makes True stand out from other dating services is it's cirminal screening and single's certification. What this does is ensures your safety when you meet someone on True. The singles certification system also verifies that the person you meet on true is really single. This eliminates profiles that aren't real and leaves you with actual quality matches.